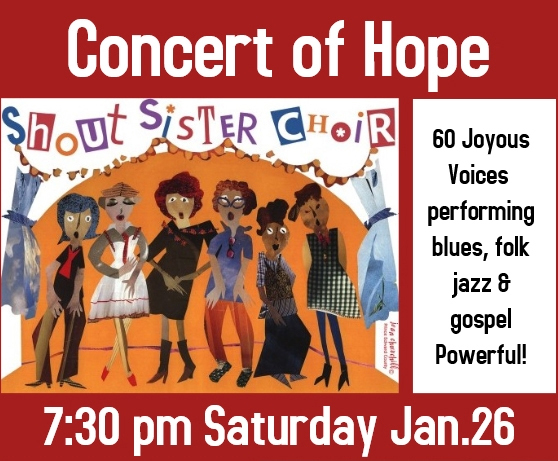 Beach United Church hosts the Concert of Hope on the evening of Saturday, Jan. 26. The Concert of Hope is set for Beach United Church, 140 Wineva Ave., on Saturday, Jan. 26 at 7:30 p.m. The concert will feature award-winning singer/songwriter Abby Zotz directing the Shout Sister Choir in the first half of the concert, and then performing her own songs accompanied by guitarists Chris and Joel Saunders in the second half. The Shout Sister Toronto South East Chapter is a 60-voice choir that performs blues, folk, jazz and gospel. Tickets are $20 (adults), and $10 for kids under 10. They are available online at Eventbrite.ca or at the door.